Last night, NBC and Jay Leno closed the book on The Jay Leno Show, an experiment in programming that Entertainment Weekly has named the biggest bomb in television history. Though the show wasn’t a big success (particularly for the local station affiliates that essentially demanded its cancellation), it made financial sense for the network and often outperformed Leno’s Tonight Show run. In any case, Leno closed out his show without much of hoopla. Like the last episode of The Tonight Show with Jay Leno, any sentiment is muted since Leno will be back on the air in a similar format very soon. Last time, he got a four month break. This time, he’s getting a month and a half. NBC’s strategy is to repair Leno’s image and put The Tonight Show with Conan O’Brien behind them as quickly as possible. Like the rest of the run of the Jay Leno Show, there were few surprises in the series finale. About the only unscripted moment comes when an older man in a black leather jacket approaches Leno at the end of his handshaking ritual with the audience. The man stands at the edge of the stage for several seconds and says something unintelligible to the host. Whatever he says, but it doesn’t appear to affect Leno one way or the other. Is The Jay Leno Show the biggest bomb in TV history? Kutcher then goes on to talk about his exploits attending the Super Bowl and losing thousands in a bet. After some more chit-chat, Leno “surprises” Kutcher with recent retiree Kurt Warner. The two toss a football back and forth, with Kutcher being hampered by weather conditions — first wind and leaves, then fake snow, and finally by cold “rain” courtesy of a garden hose. The next guest is recent Best Actress nominee Gabourney Sidibe, talking about her role in the movie Precious and how her life has changed. She shares that she essentially went on one audition and is now nominated for an Oscar. Leno runs out of time after that and barely has time to ask the audience to (please) stay tuned for the local news. 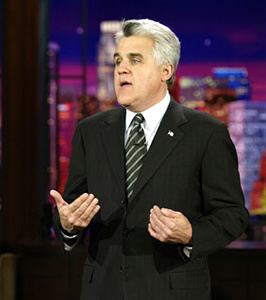 Would Leno have had some parting comments or messages for the audience about the show? We may never know but, no matter. Before you know it, he’ll be right back.